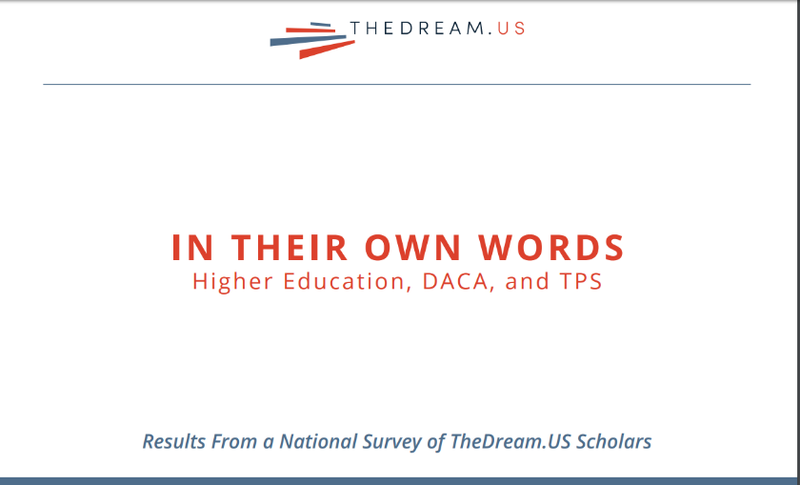 We are proud to share with you In Their Own Words – a report which summarizes your responses to our survey regarding the impact of the loss of DACA and TPS. The results allowed us to see what you are experiencing as Scholars, your employment and educational gains, and the uncertainty and anxiety in which you live. The report includes recommendations for federal, state, and local policymakers, colleges and universities; the business community; mental health providers; and communities. We encourage you to share the report with your professors, classmates, and community leaders, as well as work colleagues and employers if you feel comfortable doing so. It may help move them to take steps that will support DREAMers to and through college. Thank you for being brave and using your voices. Everyone should be as lucky as we are to witness your resilience amid fears and anxiety, and your relentless desire to succeed. We greatly admire your drive and determination in the face of obstacles.